Tube complement: 12BE6 mixer oscillator, 12BA6 IF, 12AT6 detector, 50B5 audio output, 35W4 rectifier. Approximately 9 inches / 228 mm wide. 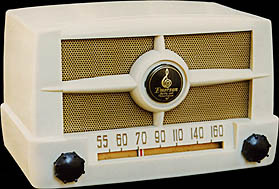 After producing the 587 for a few months, Emerson replaced it with the model 587 "Series B," below. There are no changes between the two versions to speak of, except for the dial pointer and the grille material. Perhaps the 587B's expanded-metal grille was cheaper to produce than the nifty woven-plastic design of the 587A. 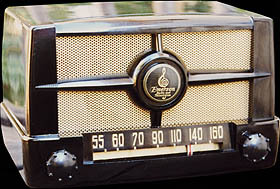 Or perhaps the metal grille was thought to be more "up-to-the-minute" in terms of style. 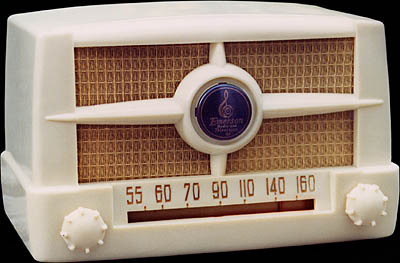 Both ivory radios' cabinets are of unpainted ivory Plaskon. 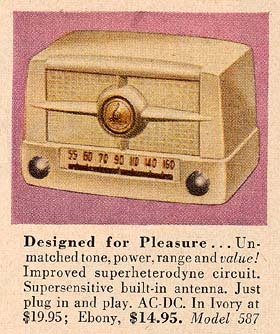 An excerpt from a December 1949 Emerson magazine advertisement, showing the model 587 in ivory.